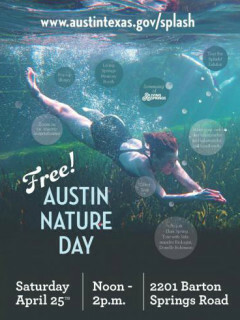 Celebrate Austin Nature Day at the Splash! Exhibit by Barton Springs Pool. The event will feature screenings of the Living Springs documentary, a tour of Eliza Spring with a salamander biologist, hand-on crafts and activities for the young (and the young at heart) and much more.